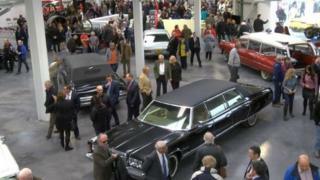 A multimillion-pound motor museum housing about 300 vehicles belonging to a father and son has opened in the Isle of Man. The Isle of Man Motor Museum, which has 70,000 sq ft (6,500 sq m) of exhibition space, is the brainchild of Denis and Darren Cunningham. Denis Cunningham said: "It's going to be something special for the island." Hundreds of guests attended a ceremony during which the lieutenant governor opened the £5m facility. Darren Cunningham said: "It is fantastic to get to this day. It has been a passion of mine for 10 years and to be stood here is the realisation of a dream I have shared with my father. "I couldn't have done it without him. He gave me my love of cars and this museum, we feel, can really rejuvenate this part of the island." Denis Cunningham said: "We've worked so well together over many years to arrive here. It is a very special day." He began his collection more than 30 years ago with a small number of classic cars. Image caption About 150 cars and as many motorbikes will be on permanent display. He passed his passion on to his son and the collection now boasts vehicles from around the world. About 150 cars and as many motorbikes will be on permanent display. The collection also includes buses, trucks, fire engines and ambulances. Isle of Man Chief Minister Allan Bell said: "This is a really important day for the Isle of Man and for Jurby. "It is a major attraction and a real boost for the north of the island."